Virtually nothing is wasted. Giving generators a sustainable cost-effective disposal solution. In most disposal facilities, waste is received and then treated according to its properties. Some wastes will end up in landfills and others burned off. In rare cases, there is a truly “Closed Loop Recycling” system that allows for the received waste to be treated and then turned back into reusable product that will be sold back into industry. Our own solvent distillation and energy recovery process is just such a system. We receive hazardous and non-hazardous wastes that are compatible with our solvent distillation and waste to energy systems. Liquids that we receive are filtered and blended in one of our blending tanks and then directed to one of our solvent recovery stills. Solid wastes that we receive are thermally treated at 1500℉ to generate steam that actually power our recovery stills. 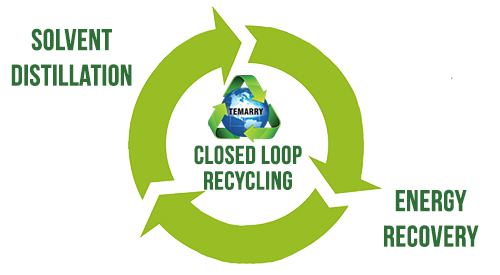 In our eBook, Acceptable Waste Codes Guide, you can review the complete list of the acceptable waste codes Temarry receives. Waste solids are received, sorted and finger print analysis is performed. Solids are packaged into proper size burnable containers and placed on the feed conveyor. Burn in the primary chamber is initiated by clean burning propane gas that heats the primary chamber to 1500 F, which is the basic operating temperature. Once at this operating temperature, the unit becomes self-sustaining and the primary burner turns off. Heat then travels to the secondary chamber. Solids, or ash, fall out of the burn unit on to the ash conveyor system and deposits into an ash hopper. Ash is later blended with other liquids for cement kiln fuel blending. All vapor from the primary burn chamber are directed to the secondary chamber where there is a retention time of 2.5 seconds. All volatile organic compounds are eliminated by thermal destruction. After heat is dissipated to the boiler, airstream is then directed, via large fans, into a two-stage venturi scrubber system to insure that no particulate is emitted into the atmosphere. Vapors are monitored to ensure the correct ph balance. If the ph levels are too high or too low a reagent is injected to neutralize the airstream and remove almost all particulate. The final stage, of the two-stage gas scrubber process, is to scrub any remaining particulate that may be remaining. Waste solvents are received, sorted and finger print analysis is performed. Liquid drums are pumped and filtered. After filtering, solvents are pumped to the distillation unit. Volatilized solvent vapors expand into the fractionation column. After the frac column comes the heat exchanger that cools off the solvent. Pure solvent is cooled down through a heat exchanger and is directed to a finished product tank. With a Closed Loop Recycling system, virtually nothing is wasted. Wastes like flammable solvents, including alcohols, ketones, naphtha, paint related materials, flammable mixtures with and without halogens can be recycled effectively and reintroduced back into industries that have a need for recycled solvents. Organic solids have the fuel value used locally before sending ash byproduct to cement kilns to be utilized in the cement manufacturing process. For every 60 cubic yards of solids utilized for fuel locally, there is only 1 cubic yard of ash generated.